Warren Gamaliel Harding ( November 2, 1865 – August 2, 1923) was an American politician and the 29th President of the United States, serving from 1921 to 1923, when he became the sixth president to die in office. A Republican from the U.S. state of Ohio, Harding was an influential newspaper publisher with a flair for public speaking before entering politics, first in the Ohio Senate (1899–1903) and later as lieutenant governor of Ohio (1903–1905). His political leanings were conservative, and his record in both offices was relatively undistinguished. At the conclusion of his term, Harding returned to private life, only to reenter politics ten years later as a United States Senator (1915–1921), where he again had a relatively undistinguished record, missing over two-thirds of the roll-call votes. An unknown politician at the time of the 1920 Republican National Convention, Harding emerged as a dark horse to become the presidential nominee through political maneuvering. In the 1920 election, he defeated his Democratic opponent James M. Cox in a landslide, 60.36 % to 34.19 % (404 to 127 in the electoral college), becoming the first president born after the culmination of the Civil War. He adopted laissez-faire policies both on economic and social policy. While on the final leg of a tour of the western states and the Alaska Territory, Harding died in San Francisco, California, 27 months into his term, at age 57. The cause of death was first said to have been food poisoning acquired during a stop-over in Vancouver, British Columbia. It was later believed that he died from apoplexy or a stroke; medical scholars now believe that Harding died of end-stage heart disease. He was succeeded by Vice President Calvin Coolidge. Because of several scandals involving others in his administration, after his death Harding gained a reputation as being one of America's least successful Presidents. In numerous polls of historians, Harding is ranked as one of the worst, or even last. However, some recent writers have come to different conclusions about Harding's place in history. John Dean, who wrote a 2004 biography of Harding for Times Press, has stated that "Harding is not a role model for a failed Presidency." Dr. Robert H. Ferrell, Distinguished Professor Emeritus of History at Indiana University, a Harding biographer and a leading national scholar on the presidency, concluded that Warren G. Harding was basically "a good President." President Harding was born on November 2, 1865, near Corsica, Ohio (now Blooming Grove, Ohio). Harding was the eldest of the eight children of Dr. George Tryon Harding, Sr. and Phoebe Elizabeth (Dickerson) Harding. His heroes were Alexander Hamilton and Napoleon. His mother was a midwife who later obtained her medical license, and his father taught for a time at a rural school north of Mount Gilead, Ohio. While he was a teenager, the Harding family moved to Caledonia, Ohio in neighboring Marion County when Harding's father acquired The Argus, a local weekly newspaper. It was here that Harding learned the basics of the business. His education was completed at Ohio Central College in Iberia, Ohio. While a college student, he learned more about the printing and newspaper trade while working at the Union Register in Mount Gilead. While Harding won the war of words and made the Marion Daily Star one of the biggest newspapers in the county, the battle took a toll on his health. In 1889, when Harding was 24, he suffered exhaustion and nervous fatigue. He traveled to Battle Creek, Michigan to spend several weeks in a sanatorium regaining his strength. He later returned to Marion to continue operating the paper. He spent his days boosting the community on the editorial pages, and his evenings "bloviating" (Harding's term for informal conversation) with his friends over games of poker. 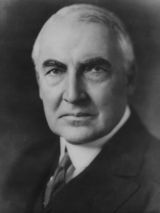 Relatively unknown outside his own state, Harding was a true “ dark horse” candidate, winning the United States Republican Party nomination due to the political machinations of his friends after the nominating convention had become deadlocked. 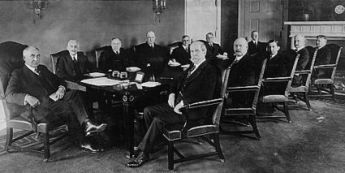 Republican leaders met in a smoke-filled room at the Blackstone Hotel in Chicago to end the deadlock. Before receiving the nomination, he was asked whether there were any embarrassing episodes in his past that might be used against him. His formal education was limited, he had a longstanding affair with the wife of an old friend, and he was a social drinker. Harding answered “No” and the Party moved to nominate him, only to discover later his relationship with Carrie Fulton Phillips. Phillips and her family received an extended tour of Asia courtesy of the Republican Party, in order to secure her silence. Mrs. Harding's newlywed brother Vetallis “Tal” Kling and his bride Elnora “Nona” Younkins-Hinaman also received an all expense-paid tour of Europe from the Hardings. The bride was a Catholic widow, and the marriage was performed in the Roman Catholic Church. At the time Catholic associations were a liability in American politics, and Catholics were targeted by the Ku Klux Klan, recently revived as anti- Roman Catholic as well as anti- black and anti-Jewish. The Klan was rapidly becoming popular in the Midwest. There is disputed evidence that Harding was a Klan member. In the 1920 election, Harding ran against Democratic Ohio Governor James M. Cox, whose vice presidential candidate was Assistant Secretary of the Navy Franklin D. Roosevelt. The election was seen in part as a referendum on whether to continue with the “ progressive” work of the Woodrow Wilson administration or to revert to the “ laissez-faire” approach of the William McKinley era. Harding ran on a promise to “Return to Normalcy”, a term he coined to reflect three trends of his time: a renewed isolationism in reaction to World War I, a resurgence of nativism, and a turning away from the government activism of the reform era. Harding's “front porch campaign” during the late summer and fall of 1920 captured the imagination of the country. Not only was it the first campaign to be heavily covered by the press and to receive widespread newsreel coverage, but it was also the first modern campaign to use the power of Hollywood and Broadway stars, who traveled to Marion for photo opportunities with Harding and his wife. Al Jolson, Lillian Russell, Douglas Fairbanks, and Mary Pickford were among the conservative-minded luminaries to make the pilgrimage to central Ohio. Business icons Thomas Edison, Henry Ford, and Harvey Firestone also lent their cachet to the campaign. From the onset of the campaign until the November election, over 600,000 people traveled to Marion to participate. The campaign also drew upon Harding's popularity with women. Considered handsome, Harding photographed well compared to Cox. However, it was Harding's support for women's suffrage in the Senate that made him extremely popular with women: the ratification of the 19th Amendment in August 1920 brought huge crowds of women to Marion, Ohio to hear Harding. Harding also believed in the clear separation of powers; that it was the Congress that was responsible for legislation, and it was Harding’s duty to ensure that it was signed into law. 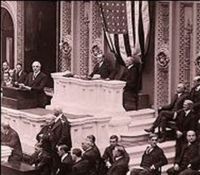 Harding also held high regard for the U.S. Supreme Court and believed that the Court’s role was to act as a safety net for Constitutional matters on behalf of the nation, its interests, and most importantly, its citizens. To solidify that notion, he nominated President William Howard Taft for the position of Chief Justice. The President also undertook a very active speaking schedule. In October 1921, in Birmingham, Alabama, Harding spoke out in favour of thoughtfully approaching the issue of race, stating that the nation could not enjoy the promises of prosperity until the matter of equality was addressed. Warren Gamaliel Harding was the first President to visit Alaska. Warren Gamaliel Harding was the eldest of eight children. Warren Gamaliel Harding was the First American President to take office after World War One. Warren Gamaliel Harding was the First President that was born after the culmination of the civil war. Upon winning the election, Harding appointed many of his old allies to prominent political positions. Known as the “ Ohio Gang” (a term used by Charles Mee, Jr., for his book of the same name), some of the appointees used their new powers to rob the government. It is unclear how much, if anything, Harding himself knew about his friends' illicit activities. The January 8, 2006 New York Times Magazine carried an expose of Stetson Kennedy, showing that he had systematically exaggerated and misrepresented his work for over 50 years, calling to question the veracity of many of his sources. Melinda Gilpin, site administrator for the Harding Home and Museum in Marion, argues that there is no primary evidence of Harding's Klan membership and that Harding was the first 20th Century President to speak out against the practice of lynching blacks. The 1920 Republican Party platform urged Congress to pass laws combating lynching , placing Harding's purported membership in conflict with Klan goals. Gilpin also points to the Klan's "one drop rule" (that no one who possessed even a drop of non- Caucasian blood could join the Klan) was in direct conflict with the rumors that swirled around Harding and his supposedly mixed race background. In 2005, The Straight Dope presented a summary of many of these arguments against Harding's membership and added speculation about Harding's motives as further evidence that he would not have joined (i.e. that while it might have been politically expedient for him to join the KKK in public, to do it in private made no sense). Harding was notorious for his verbal gaffes, such as his comment "I would like the government to do all it can to mitigate, then, in understanding, in mutuality of interest, in concern for the common good, our tasks will be solved." His errors were compounded by his insistence on writing his own speeches. Although it might not have been a mispronunciation as some thought, Harding's most famous "mistake" was his use of the word "normalcy" when the more correct word to use at the time would have been "normality." Harding decided he liked the sound of the word and made "Return to Normalcy" a recurring theme. Critic H.L. 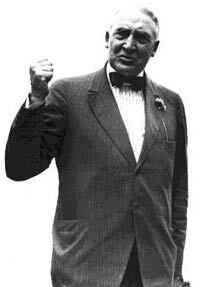 Mencken disagreed, saying of Harding, "He writes the worst English that I have ever encountered. It reminds me of a string of wet sponges; it reminds me of tattered washing on the line; it reminds me of stale bean soup, of college yells, of dogs barking idiotically through endless nights. It is so bad that a sort of grandeur creeps into it. It drags itself out of the dark abysm of pish, and crawls insanely up the topmost pinnacle of posh. It is rumble and bumble. It is flap and doodle. It is balder and dash." Mencken also coined the term "Gamalielese" to refer to Harding's distinctive style of speech. Upon Harding's death, poet E. E. Cummings said "The only man, woman or child who wrote a simple declarative sentence with seven grammatical errors is dead." Harding County, New Mexico is named in his honour. In Civilization IV, each game concludes with various statistics and a scale comparing the player's score to various historical figures. Harding has the dubious distinction of being third from the bottom, placing below such names as Nero and above Ethelred the Unready and Dan Quayle. Harding was known to host poker games at the White House. 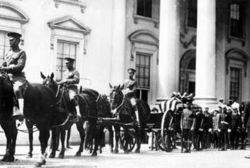 A legend has it that Harding once lost a set of White House china that had belonged to President Benjamin Harrison; White House historians have since debunked that myth. Harding's political rise is discussed in Malcolm Gladwell's book " Blink". Gladwell attributes Harding's success and popularity to his commanding physical appearance and deep gravelly speaking voice, which caused people to overlook or forgive his lack of competence. Gladwell called this the "Warren G. Harding Error."